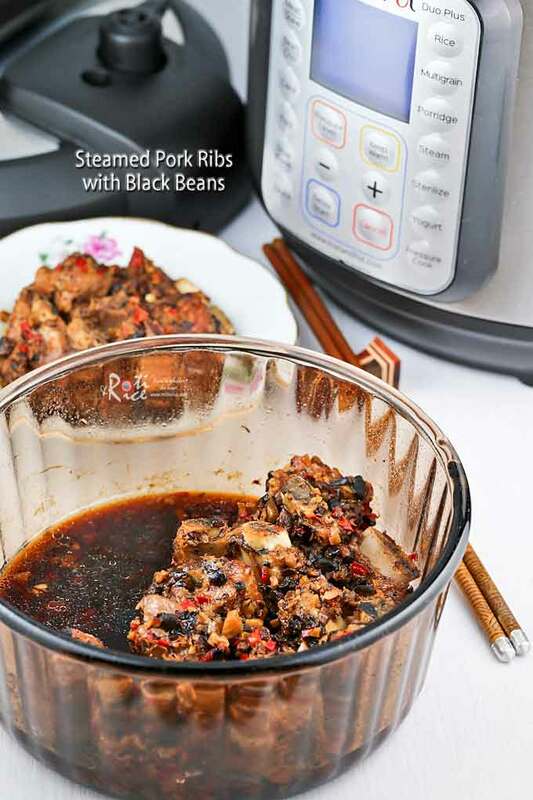 Prepare this tasty Steamed Pork Ribs with Black Beans in a pressure cooker for fork tender deliciousness. Super easy and fuss free. Steamed Pork Ribs with Black Beans are a dimsum mainstay. These tasty morsels come in small plates. The color is usually a little lighter because whole salted/fermented black beans are used. They often come with more bones than meat to chew on. Yet they are very popular, even though they may be a little tough at times. As such, I am never quite a fan. 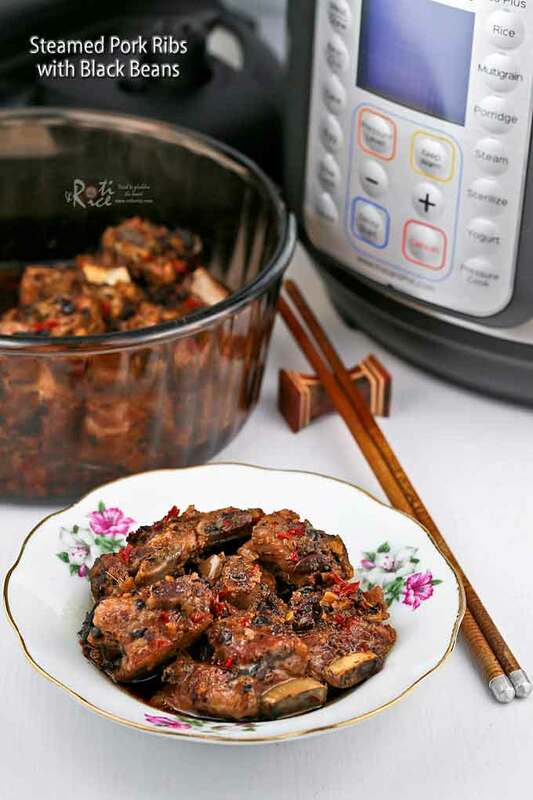 Ro-Ri San enjoys this dish a lot and so I decided to make it at home using the pressure cooker to ensure that the meat is fork tender. I used a mix of chopped salted/fermented black beans and soy beans to give it a sauce-like consistency. Other ingredients include chopped ginger, garlic, and red chili. Together they are mixed with the pork rib tips and left to marinate for 30 minutes for better flavor. The result is a rich sauce that is amazing served with steamed rice. In this recipe I used pork rib tips with some white cartilage because they can be meltingly tender. It is best to cut them into small pieces. Otherwise, please use baby back ribs which are about 3 inches in length. Spare ribs may be too big and will require a longer cooking time. If you prefer not to use a pressure cooker, you will likely need to increase the steaming duration. Add 10 minute increments and check for tenderness as you go. You can also place the ribs in several small plates if your steamer is large enough to accommodate them. 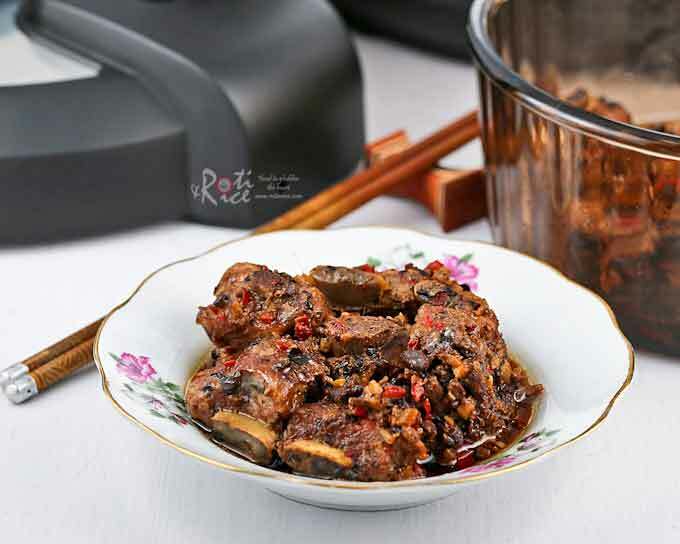 Combine pork rib tips, Shao Hsing cooking wine, and salt in a medium bowl. Minced ginger, garlic, red chili, fermented black beans, and fermented soy beans. Place in a small bowl. Stir in sugar and pour mixture over pork rib tips. Stir to get pork rib tips well coated. Marinate for 30 minutes. Pour 3 cups (720ml) water into the pressure cooker pot. Drizzle sesame oil over the marinated pork rib tips. Cover bowl with a piece of aluminum foil. Place bowl on steaming rack and transfer into the pressure cooker pot. Close and lock the pressure cooker lid. Turn steam release handle to “Sealing” position. Press [Steam] and set time to 50 minutes. It takes about 12 minutes for the pressure to build up. 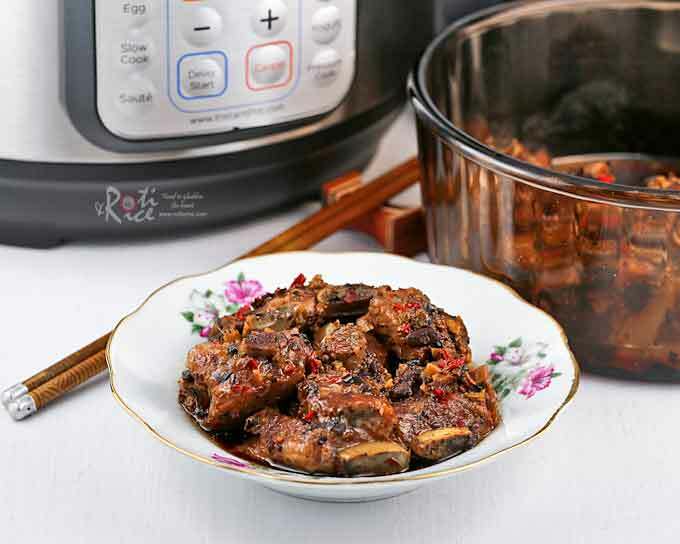 Remove the bowl of pork rib tips from the pressure cooker and serve immediately.